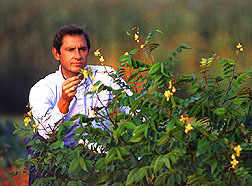 Agronomist Brad Morris inspects coffee senna, Senna occidentalis, which could have potentential antitumor, laxative, and antiseptic properties. When Brad Morris walks into the seed storage room at his U.S. Department of Agriculture lab, he often wonders what pharmaceutical secrets may be hidden inside the velvet beans, jack beans, and winged beans tucked away in paper bags in the 40° F air. Those are only a few of the legumes waiting for outside researchers to take a peek at their potential as future sources of drugs and other medicines, says Morris. "I see the collection as an unopened medicine chest," he says. Morris is curator of the special-purpose legume collection maintained by USDA's Agricultural Research Service in Griffin, Georgia. Curators often develop an attachment to their collections, and Morris is no exception. He likes to talk about the potential of his offbeat, largely unknown assortment of legumes you never heard of—at least not yet. Morris notes that legumes are the third-largest family of flowering plants, with an estimated 20,000 known species worldwide. But only a handful—peanuts, soybeans, peas, lentils, beans, alfalfa, clover, and vetch, for example—are grown on a wide scale. Many of the rest are in sealed bags in a cold-storage pharmacy, so to speak. Click here for table listing potential phytochemicals from the Griffin collection. The Griffin collection contains more than 4,000 accessions. Winged bean, jack bean, and velvet bean (also called cowitch) sound odd enough—but how about snout bean, ringworm bush, and fish poison bean? "Most of the accessions are from tropical countries, which is one reason why they aren't as well known in this country," Morris says. "But many of these legumes are valuable sources of everything from insecticides to brain chemicals such as dopamine and serotonin." Take, for example, the winged bean, Psophocarpus tetragonolobus, a plant with high levels of proteins called lectins, which medical researchers use as diagnostic tools because they bind to certain blood cells and specialized transport cells. 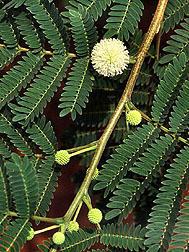 Lead tree, Leucaena leucocephala, is checked under field conditions for such traits as flower color and flowering date, pests, and maturity. The plant is used for fiber and livestock feed. Mich Hein, a scientist at Scripps Research Institute in La Jolla, California, was looking for a source of winged beans for his research to determine how vaccines might be delivered in edible foods. The Griffin collection had the winged beans he was looking for. Once he received the seed, Hein grew the plants in greenhouses and within several months tested them for lectins. He found several that produced high levels of a specific lectin he wanted. In his lab studies, Hein fed the lectin to mice and found that it binds to M-cells in the animal's small intestine. M-cells are "lookout" cells that sample proteins in the gut and then transport them to the immune system—which may then send out antibodies in response. Hein says the winged bean lectin, when fed to mice, stimulates their immune system to produce antibodies that recognize the lectin—the same response that a vaccine elicits. "We're trying to determine if plant lectins cause a similar response in humans," Hein says. "The winged bean collection has been important in our preliminary studies, which we hope will allow us to design edible vaccines in the future." Morris notes that winged beans, aside from being a source of lectin, also contain erucic acid (an antitumor medication) and polyunsaturated fatty acids that can be used to treat acne and eczema. Another special-purpose legume that has drawn interest is kudzu, Pueraria montana var. lobata. The plant was originally brought into the United States from Asia as a cattle feed and ground cover. Now kudzu is considered a noxious weed in certain states, having overgrown many a roadside landscape. Michael Byrne, president of Propagation Technologies, based near Kalamazoo, Michigan, ordered kudzu seed from Morris last year after receiving permission from Michigan authorities to grow the weed in the greenhouse to evaluate its pharmaceutical potential. Byrne says he saw a television report that the plant may contain chemicals that could help treat alcoholism. The roots are used as a food starch/thickener, so supposedly it was through the use of the root as food that the reduction of alcohol craving was first noticed as a side effect. In the greenhouse, Byrne is growing out kudzu seeds from Griffin and other sources to evaluate their potential. 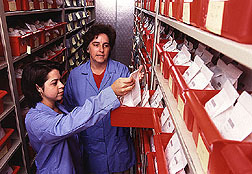 Technician Tiffany Bethune (left) and seed storage manager Lee Ann Chalkley retrieve one of more than 90,000 seed samples which are stored at the Plant Genetic Resources Conservation Unit in Griffin, GA.
"The active ingredient could be found in the highest concentration in the roots, seeds, or leaves. We don't know yet," Byrne says. "But we think it's worth investigating. There are a lot of fairly innocuous-looking plants around that can do some amazing things." Morris says kudzu, which should be studied in indoor containment facilities in areas where it's considered a weed, is a source of a number of chemicals including daidzein (an anti-inflammatory and antimicrobial), daidzin (a cancer preventive), genistein (an antileukemic), and others. Norberta Schoene, a chemist with ARS' Beltsville (Maryland) Human Nutrition Research Center, has conducted rat studies showing that genistein, a plant estrogen, reduced aggregation of blood clots by 57 percent. Such clotting, she explains, contributes to clogged arteries and eventually to heart attacks. She also notes that in Asian regions—where people eat tofu, miso soup, and other soybean products as a dietary staple—there are lower levels of breast and prostate cancer and heart disease than in Western countries, where soybeans are a much smaller part of the diet. Soybeans and black beans are rich sources of genistein, which is also being examined for fighting the leukemia that strikes bone marrow and other blood-forming tissue. Soybeans also contain high levels of daidzein, which the Chinese have long used as an herbal medicine and to cut the craving for alcohol. As Morris noted, kudzu—which Byrne is investigating as an alcoholism treatment—also contains daidzein. Agronomist Brad Morris (left) and technician Gerald Weatherly conduct field observations to identify potentially valuable genetic traits for research use by breeders and scientists worldwide. "It doesn't hurt to investigate folk remedies, because they may have a scientific basis," Schoene says. Some of the special-purpose legumes are also excellent sources of alkaloids, which the plants produce in their leaves to protect them against insects, diseases, and herbivores, explains Prakash Kadkade, a scientist with Phyton, Inc., a biopharmaceutical company based in Ithaca, New York. Examples of plant alkaloids are nicotine, quinine, cocaine, and morphine. "We are screening many plants in search of compounds that we think may have therapeutic potential," Kadkade says. Morris has also received requests from researchers in Paraguay for guar, Cyamopsis tetragonoloba, which yields galactomannan gum used as a stabilizer in confectioneries. And scientists in Italy have requested velvet bean, Mucuna pruriens, a source of the dopa that's converted by the brain to the neurotransmitter dopamine. Reductions in dopamine have been associated with Parkinson's disease, which occurs when brain cells that produce dopamine are destroyed. Along with their pharmaceutical potential, the special-purpose legumes also fix nitrogen, enriching the soil and making them ideal candidate crops for sustainable agriculture. Some legumes can add up to 500 kilograms of nitrogen per hectare to the soil—alleviating the need for fertilizer and lessening the chance of water pollution. "We've only scratched the surface on the potential of these legumes," Morris says. — By Sean Adams, ARS. 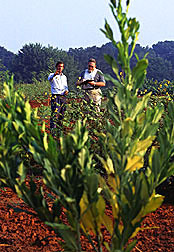 Brad Morris is in the USDA-ARS Plant Genetic Conservation Resources Unit, Regional Plant Introduction Station, 1109 Experiment Street, Griffin, Georgia 30223; phone (770) 229-3253. "Special Legumes May Be an Unopened Medicine Chest" was published in the November 1996 issue of Agricultural Research magazine.